Detail from The Bath, © Jocelyn Lee, 2016. Lee is represented by the Huxley-Parlour Gallery. Photo provided by Sybylla Smith. AIPAD, the longest-running exhibition dedicated to photography, is having a Goldilocks moment. Attendees including gallerists, curators, book publishers, photographers and collectors have varied opinions on its move to Pier 94. For some the venue is too big, for others the feel too impersonal, and for yet another contingent harboring Armory-based nostalgia, the directional change in focus from vintage fine art photography to contemporary offerings remains a challenge. In my opinion, during this second run in the new location, the size, the feel and the focus were just right. Last year felt like an attempt to be a mini-Paris Photo. This fair seemed more true to itself, asserting a command of AIPAD’s evolution. The exhibition roster was reigned in and the speaker series was amped up. Admittedly, while the sheer square footage of the Pier dilutes the intimacy of the fair, as well as, surpasses daily Fitbit quotas for steps taken; I welcome the change. Addressing a more visually sophisticated and literate constituency, arts organizations are being called to innovate and explore new paradigms. Photography has seen a sea-change due in part to technological advances and globalization. From my perspective the Association of International Art Dealers honed-in and laid claim to their unique provenance within the contemporary art market. Offerings from 130 international galleries exhibited photo-based art, video and new media over four full days. 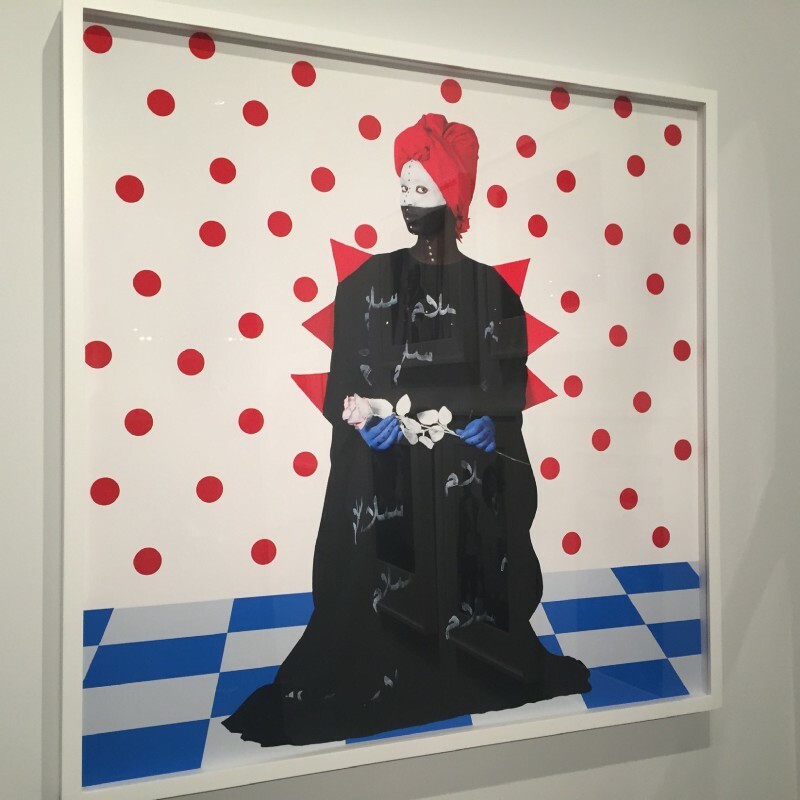 Deliberate attention to issues of justice along with a focus on exhibiting images of untold and/or under-represented stories permeated this fair. Fortia(2), © Keyezua, 2017. Steven Kasher Gallery. Photo provided by Sybylla Smith. Notable was the provocative speaker series, Photography Talking Back. Gallerist, Steven Kasher, articulated the intention this additional programming as a means to talk back to our current political environment. An empowered voice consisting of contemporary photographers, critics, curators, publishers and arts organizations, spoke with passion to issues of racism, gender inequity, climate change and the rise of ‘fake’ news. Anyone involved and/or interested in photography needs to stay informed and partake in this critical dialog. Boundaries are being broken and conventions challenged in unprecedented manner as our field mirrors cultural shifts at-large. Frederick Douglass articulated the powerful catalyst photography provides in addressing social change and advancing cultural education in his mid-1860’s speech, Pictures and Progress. This stellar speaker series underscored this reality while begging the question, are we ready to see and hear this now? 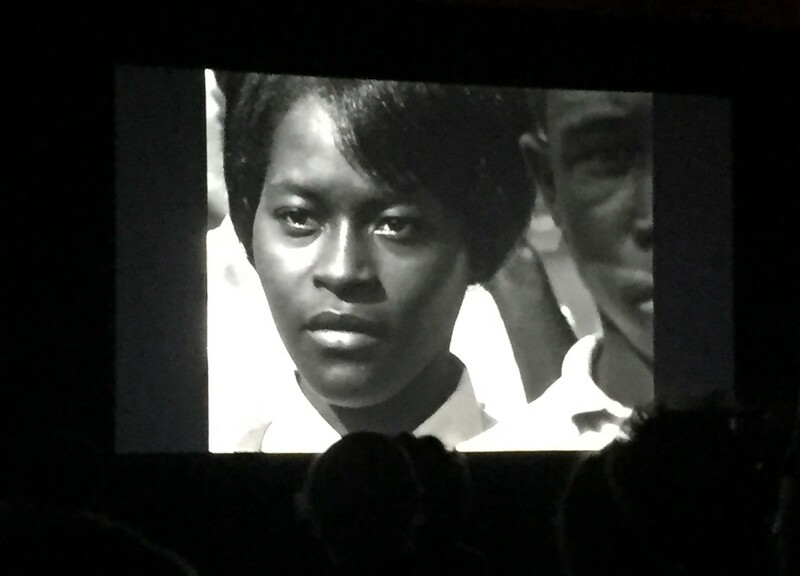 Teju Cole’s Presentation, Image by Roy DeCarava. Mississippi Freedom Marcher, Washington D.C. 1963. Photo provided by Sybylla Smith. 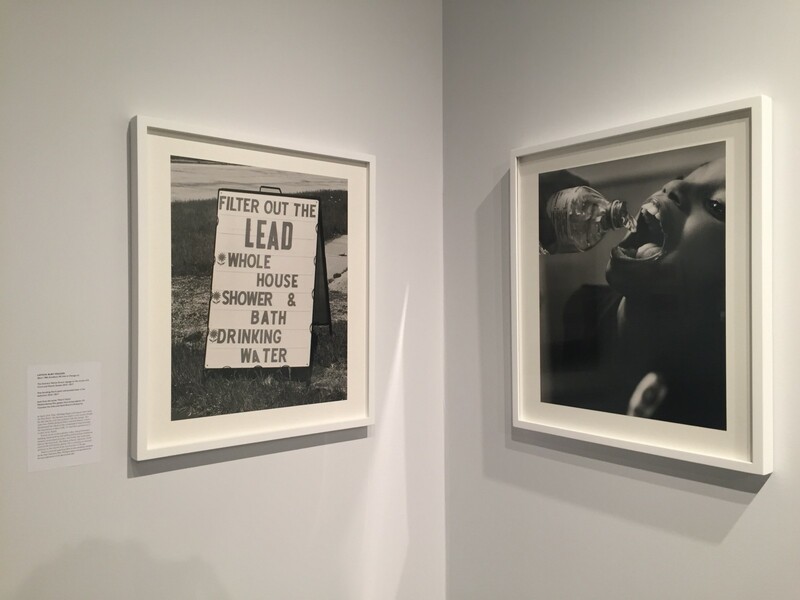 (l-r) The Grainery Nation Grocer signage on the corner of E. Court and Church Streets, 2016/7; Shea brushing Zion’s teeth with bottled water in her bathroom, © LaToya Ruby Frazier, 2016. Both images from the series Flint is Family. All Power Exhibit, AIPAD 2018. Photo provided by Sybylla Smith. The grounds for hope are in the shadows, in the people who are inventing the world while no one looks, who themselves don’t know yet whether they will have any effect…In this epic struggle between light and dark, it’s the dark side — that of the anonymous, the unseen, the officially powerless, the visionaries and subversives in the shadows — that we must hope for. I am thankful to encounter the images bearing witness of the black experience and to listen to the reconstruction of the cultural narrative freed from the shadows. History/Her Stories: Photographs by Women, the panel led by MoMA curator, Sarah Hermanson Meister, spoke to a capacity-crowd of predominantly women. A mutual admiration permeated the room, the panelists as in awe of sitting down with each other as the audience was to behold them. Every artist paid homage to Tina Barney who was the last of the women to speak. Each shared a treasure-trove of hard-won visual storytelling experience built over decades. In a perfect world we would have locked the lecture hall doors and spent the rest of the day unpacking their riches. Sofia Borges, Sam Contis, Liz Deschenes, and LaToya Ruby Frazier spoke of intention, process and context. 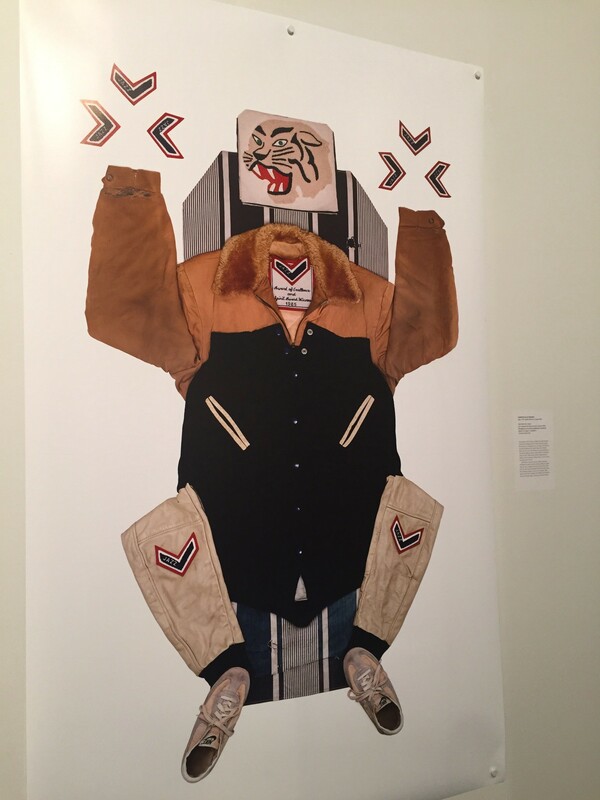 Each underscored the reality of how identity formation is directly impacted by the cultural images one sees projected. Do you see yourself reflected? Who’s narrative is being portrayed? What relationships exist between picture-making and meaning? I took issue with a comment by Tina Barney who stated, “I never thought of myself as a woman.” This topic begs a more substantial consideration. Lauren Greenfield could have been a meaningful addition to this panel as she speaks with clarity on issues of class, wealth and privilege. I applaud AIPAD for creating a place to explore photography’s role as witness and it’s complex role in shedding light on truth. I find a poetic irony in the fact photography is dependent on a relationship with light. Are we not positioned to be the light bearers, responsible for illuminating that which exists in the shadows? Photography Talking Back was a bold step forward in voicing the intersectionality of those who live in a world in which their reality is missing from view or when seen is often misappropriated. The groundwork for revealing the this fact was initiated. Individually and collectively we share the responsibility to be aware, curious and prepared to investigate how we see, what we see and why it matters. 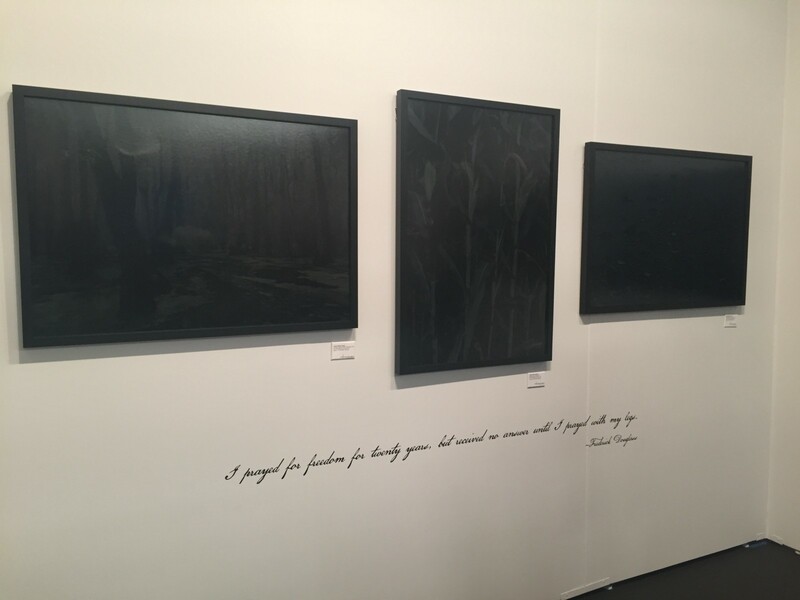 All Power Wall Title (special exhibition at AIPAD 2018). Photo provided by Sybylla Smith. Wait! Wait! Don’t Shoot! 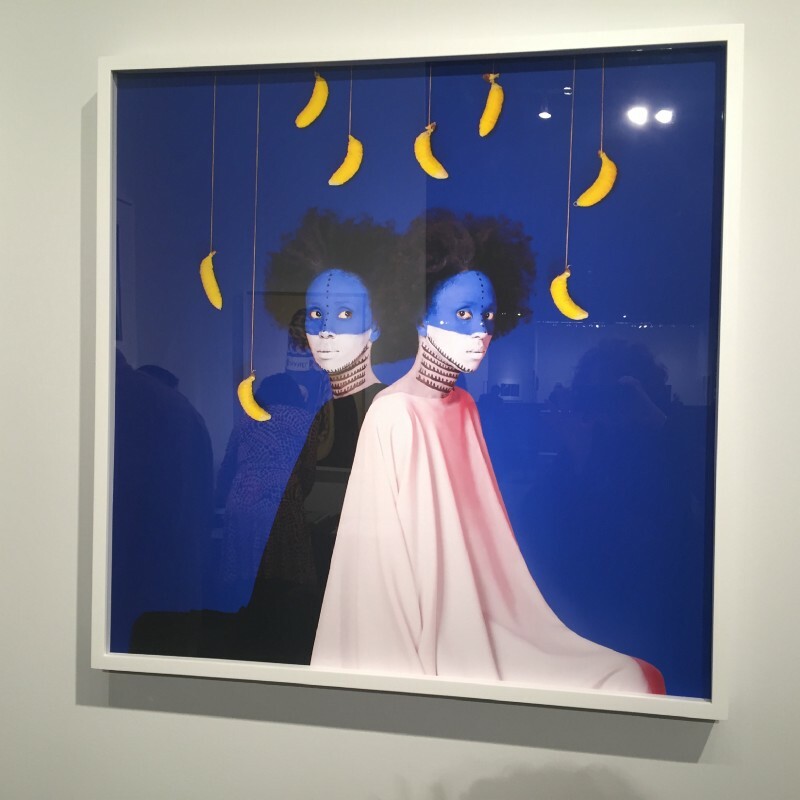 © Maikoiyo Alley-Barnes, All Power Exhibit, AIPAD 2018. Photo provided by Sybylla Smith. The Special Exhibition section featured three substantive historical bodies of work. The Baio Collection spans the history of the medium from the nineteenth century to the present with a focus on themes from childhood. Forever Young, portrays images of a universal coming-of-age experience, concurrently showcasing the physical maturation of our profession. Sir Elton John, known for his keen interest in, and deep collection of, photography, culled from fellow AIPAD collectors to compile, A Time for Reflection, sales from this compilation benefit his multiple charities. The Photographic Center Northwest’s informative exhibit, All Power: Visual Legacies of the Black Panther Party, commemorated the 50th anniversary of the Seattle chapter of the Black Panther Party for Self-Defense. 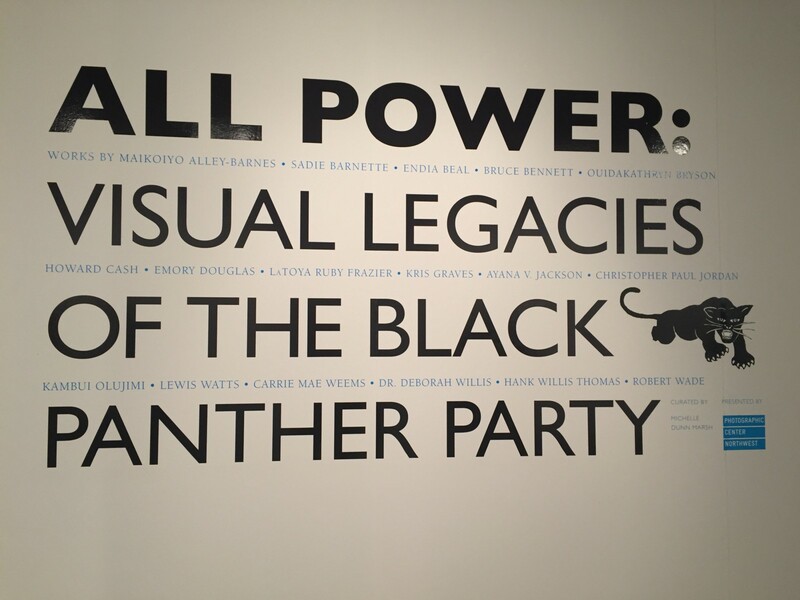 PCNW Executive Director and Curator, Michelle Dunn Marsh, initiated this group exhibit by inviting 30 Black colleagues to share work from their careers which they felt were influenced or informed by the Black Panther Party. Thirteen of the seventeen artists who responded to her inquiry were photographers and included in the original show. March co-edited an accompanying book with Negarra A. Kudumu, which is available here. Further scholarship will hopefully be initiated to continue exploration of the complex legacy of social influence and cultural contribution by this national organization. Through Darkness to Light: Seeking Freedom on the Underground Railroad. © Jeanine Michna-Bales, Arnika Dawkins Gallery. Photo provided by Sybylla Smith. The Ghosts of Khmer: Light and Memory. © Binh Danh, Lisa Sette Gallery. Photo provided by Sybylla Smith. I appreciate the brave move by galleries who highlight a single artist. It reflects conviction in the strength of the artists’ work and the power of their story. Arnika Dawkins Gallery of Atlanta, Georgia hosted Jeanine Michas-Bales’s series, Through Darkness To Light: Seeking Freedom on the Underground Railroad. Envisioning the 1,400 mile journey through the eyes of an escaping slave, Michas-Bales photographed sites from Louisiana to Canada, in the dead of night, devoid of people. Her haunting images are unprecedented in providing a visual depiction of the first civil rights movement in the United States. Photographer and educator, Binh Danh, was the sole artist featured by Lisa Sette Gallery of Phoenix, Arizona. His luscious daguerreotype photograms belie the complex subject matter in his series, The Ghosts of Khmer: Light and Memory. Brilliantly layered with nuanced context their play of light, shadow, and reflection places the viewer as participant within humanity’s paradox of inuring both darkness and beauty. (from l-r): Seed of the Soul; Both Sides © Aida Mulineh, 2017; Chanel #VII, © Wesaam Al-Badry, 2017. All artists represented by Jenkins Johnson Projects. Photo provided by Sybylla Smith. Jenkins Johnson Gallery showcased glossy stylized imagery which captured your imagination while delivering a subsequent cultural punch. Two artists stand out in regard to their investigation of objectification and stereotype. In Al Kouture, Iraqi photographer Wessam Al-Badry, utilizes appropriation in his repurposing of couture silk scarves as niqabs. 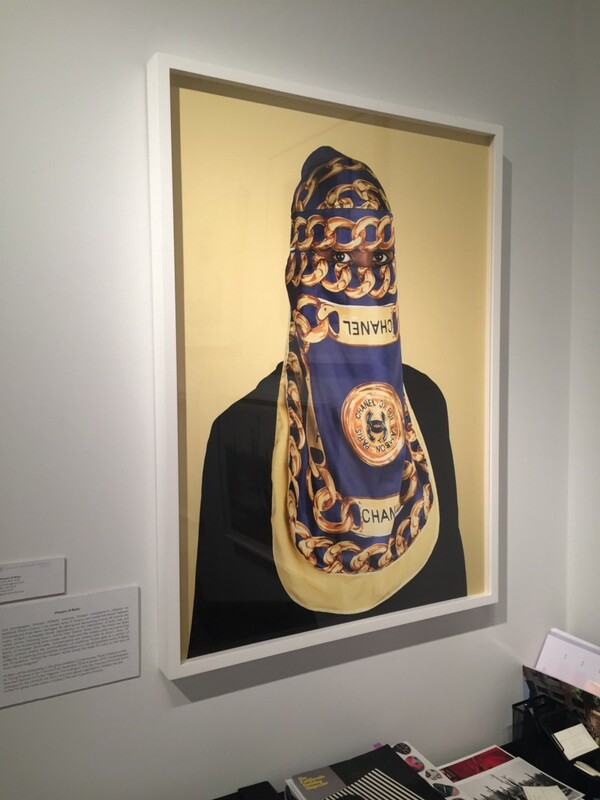 His paradoxical use of a luxury fashion accessory in the form of a religious covering places latent assumptions in the spotlight. Ethiopian photographer, Aida Mulineh, references the historical use of body paint as she explores contemporary African identity in her series, The World is 9. Her intention is twofold, to show empowered Black women and draw awareness to our common humanity exemplified in shared cultural expressions. 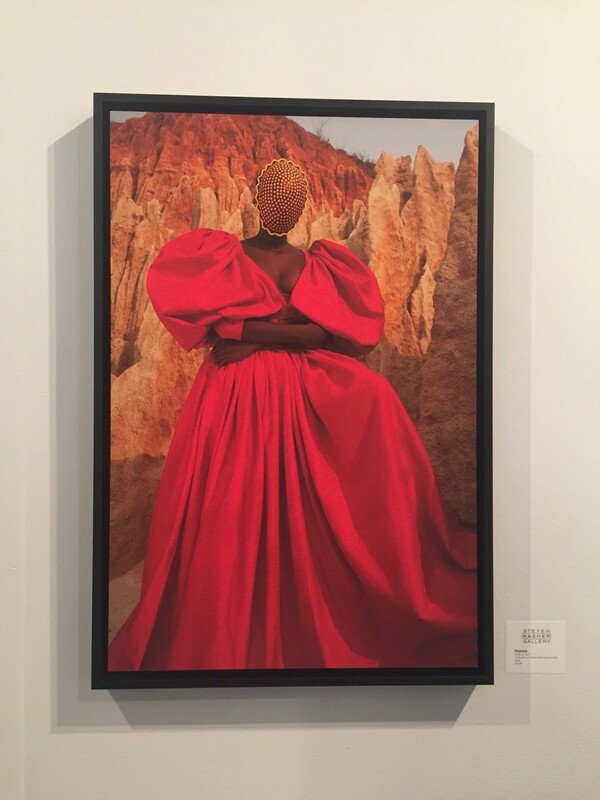 Her work is also exhibited in MoMA’s Being: New Photography 2018. Two highlights of attending AIPAD are discovering new photographers and/or seeing new ways photographers you know evolve. I enjoyed being introduced to the evocative portraiture of Italian photographer, Jocelyn Lee, exhibited by Huxley-Parlour Gallery. The Bath, 2016, a part of her series, The Appearance of Things, suspends a lush sensuality. 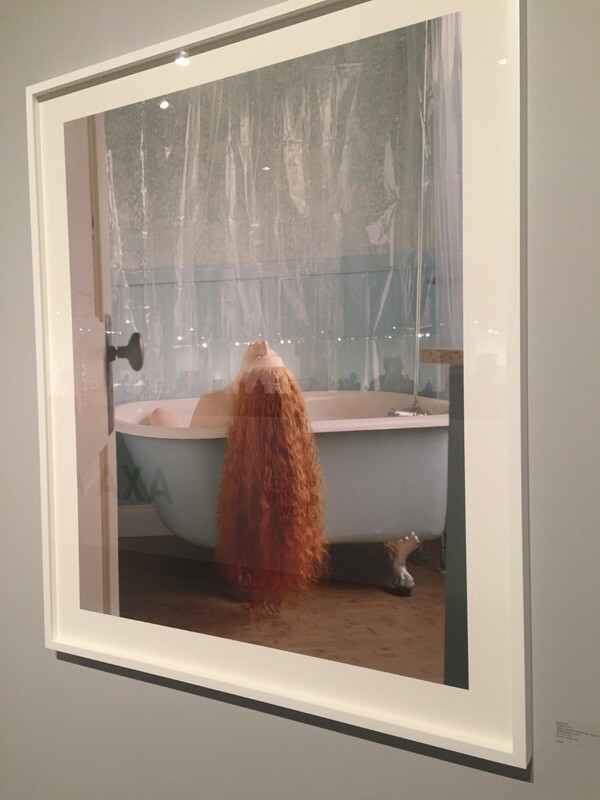 Half the frame is filled with a mane of red hair spilling from a porcelain-skinned woman sitting sideways in a pale blue ball and claw tub. I found myself repeatedly conjuring up this image in my minds eye playfully reflecting the myriad narratives it evokes. (from l-r): Inversion, © Daisuke Yokota, 2015. The Bath, © Jocelyn Lee, 2016. Huxley-Parlour Gallery. Photo provided by Sybylla Smith. Lastly, AIPAD provides an unparalleled learning opportunity to garner insight in to the innovative output and display options currently trending. Dye sublimation prints are in evidence. A neon sign announcing Cig Harvey’s work at Robert Klein Gallery was reflected in framed and flush-mounted Dibond prints by Olivia Parker. 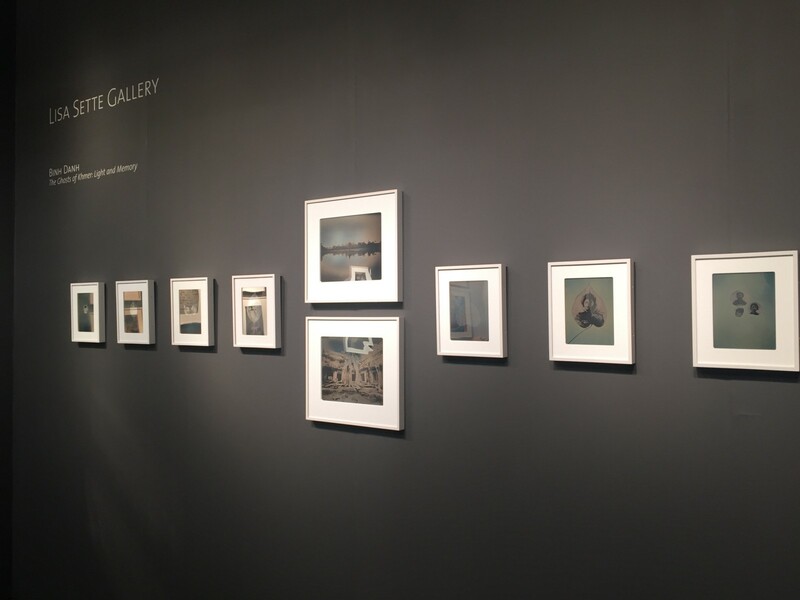 The Stephen Daiter Gallery takes framing seriously, working to complement and echo the photographers intention. 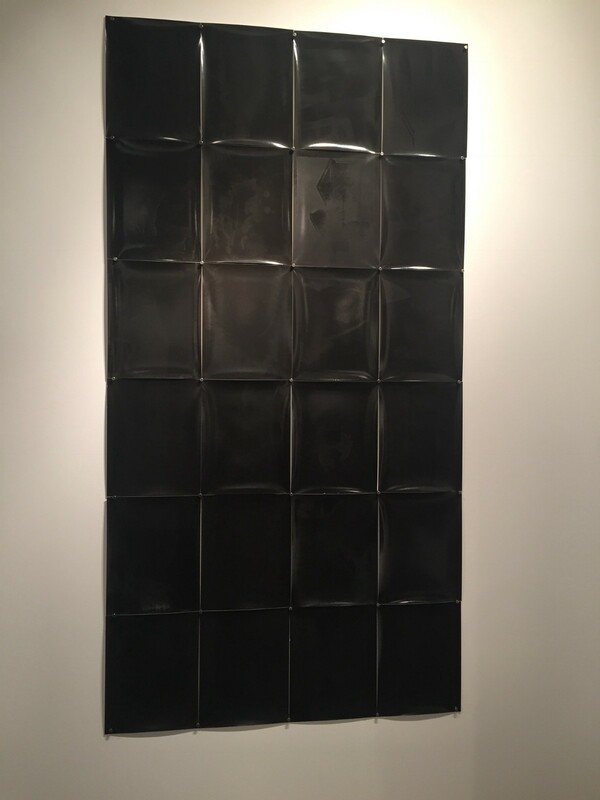 Japanese photographer, Daisuke Yokata’s, Inversion, (2105) is a unique grid of solarized gelatin silver prints exhibited by the Jean-Kenta Gauthier Gallery. The tone-on-tone gun metal gray rectangles slowly reveal figures as elusive as a memory or dream. Once purchased they could be contained within a traditional frame behind glass or be accessibly vulnerable adhered to a wall as in the gallery by minimalist magnetic cubes. 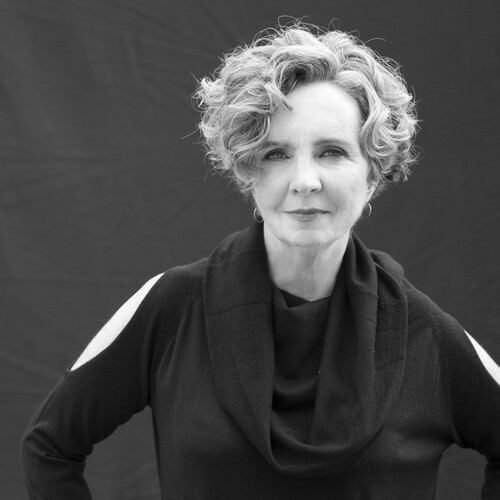 J.Sybylla Smith is an independent curator with over 27 solo or group exhibitions featuring over 80 international photographers exhibited in the U.S., Mexico and South America. Smith consults with individual photographers and arts organizations to develop exhibitions, educational programming and written content including artist statements and marketing material. An adjunct professor, guest lecturer and thesis advisor, Smith has worked with the School of Visual Arts, the School of the Museum of Fine Arts, Wellesley College, Harvard University, and Emmanuel College. She lectures and conducts workshops on Concept Aware®, a unique creative framework of concept development for artists illustrated through contemporary photography. If you found this article compelling, please let us know by holding down the cursor on the clapping hands. And please follow our publication if you haven’t already!